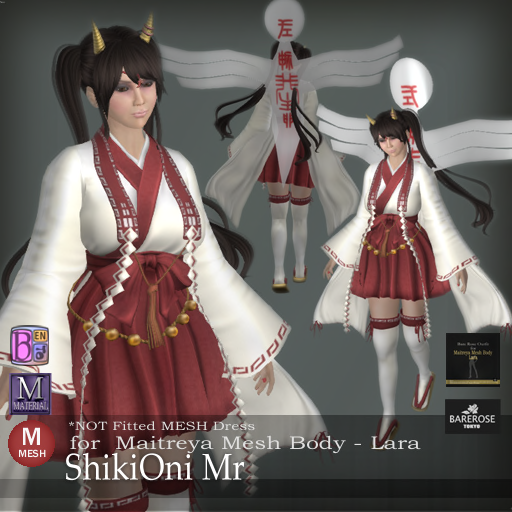 The ShikiOni Mr is the MEsh version of the ShikiOni from Bare Rose and this is a free raffle gift when you are in the Bare Rose Main Store. The fitting is simple for the Maitreya body and only a few little twitch to hide off some part, and it looks perfect from every angle. This is one of the selling point of the Mr series from Bare Rose. The ShikiOni is based on Japanese word "Shiki" which ceremony and "Oni" is ghost literally. While Shikigami (ceremony gods) are common in many legends and folktale in Japanese, they are summoned creatures which usually are puppets that look like the one on the back of the outfit. Can you tell why this outfit is not a Shikigami but ShikiOni? Well, do you see the horns on the head? It is a nice alternative. Of course, the horns are also optional if you do not like them.